The Philadelphia Phillies are playoff-bound for the first time since 1993! This year’s race for the National League East division title gives new meaning to the word improbable. On Sept. 12, the Mets held a seven-game lead over the Phillies with 17 games left in the season, and the Phillies’ chances for a wild-card spot in the playoffs seemed unlikely at best. But over the next 16 games, the Phillies won 12 while the Mets lost 11, and the race came down to the 162nd and final game of the season. And, unlike so many bitterly disappointing moments in Philadelphia sports history, everything went Philly’s way for a change. The Phillies defeated the Nationals, 6–1, the Mets lost to Florida, 8–1, and believe it or not, the Phillies captured the NL East crown for the first time in 14 years. A few of my friends are Mets fans, and I refuse to gloat over their team’s misery. In fact, I truly feel their pain, since the Phillies have given me plenty to complain about in the past. Remember, the Phillies have only won one World Series title in 124 seasons and have contributed to our city’s championship drought since 1983. They collapsed in late 2003, then struggled early and ultimately collapsed again in 2005, despite the fourth-highest payroll in the league that year. And the Phillies came close to a wild-card berth in 2006, but they were eliminated from playoff contention on the final weekend of the season for the second straight year. As for this year, I took note of the Phillies’ 10,000th loss in July, and about a month before they reached that embarrassing milestone, I angrily predicted that the Phillies would fail to make the playoffs if pitcher Jose Mesa remained on the pitching staff. Mesa did stay with the team and finished the season with a dreadful ERA of 7.11, but the Phillies ended up in first place in spite of him, and I’ve never been happier to be proven wrong. Speaking of predictions — this past January, Phillies shortstop Jimmy Rollins (one of my favorite Phillies players ever) declared that the Phillies were “the team to beat in the NL East” this year. Well, Rollins was a man of his word and posted some MVP-worthy numbers this year (.296, 30 HR, 94 RBI). And during today’s game, he became just the fourth player ever join the 20-20-20-20 club — that’s 20 stolen bases, 20 doubles, 20 triples, and 20 home runs, all in a single season. Congratulations to the Phillies! Can’t wait for the playoffs. Fashion designer Marc Ecko, who bought the ball in an online auction, set up a Web site for fans to vote on the ball’s fate, and Wednesday announced the decision to brand it won out over the other options — sending it to Cooperstown unblemished or launching it into space. Given the dubious nature of Bonds’ home-run title, this is an appropriately irreverent outcome. Baseball fans will still have the opportunity to see the infamous ball intact at the Hall of Fame, but the permanent addition of an asterisk to the ball will attest to the average fan’s contempt for cheaters. It’s a fitting example of democratic commentary on a tainted record, and it will make for an amusing story for decades to come. Last Thursday: Before work, I dropped off my Altima at the local dealership for scheduled service. As usual, they call me by mid-morning to recommend some additional maintenance. Given my meager understanding of all things automotive, and afraid of getting stuck on the side of the road (note the foreshadowing here), I accept their suggestions. When I pick up my car that evening (after a lengthy post–5 p.m. delay due to a misunderstanding with their shuttle service), I shell out nearly $300. That’s close to what I’d paid for three of the previous four supposedly routine tune-ups, and the price seems very high, given that the car is just over 2½ years old. Friday: I drive to work and return home without incident. But as I set out to join two friends for a late happy hour, the engine struggles to turn over. Once it finally kicks in, the frustratingly vague SERVICE ENGINE SOON light appears on my dashboard. But the car seems to run fine for the rest of the evening. Saturday: About a half-mile from my house, my car completely loses power while I’m driving and rolls to a stop. I accept one woman’s offer to jump-start my car. As we fiddle with the jumper cables, a small truck with the AAA logo on its hood happens to pass by, and although the driver is on his way to help someone else, he asks if I need assistance. (Talk about insane luck; I will never win the lottery now.) The guy gets my car started again within minutes, and I return home. Later, my friend Martin graciously picks me up to join some friends at a bar in Jeffersonville, where we cringe through the PSU/Michigan game. Sunday: I still need to get my car over to the dealership on Monday morning for the much-needed repair. So I venture out in my neighborhood on Sunday morning to see how it’s running. Two-tenths of a mile later, the car promptly dies. I walk home and call AAA. A flatbed tow truck from King of Prussia arrives in less than an hour, and I ride along to the dealership. My friend John picks me up there, and I treat him to a well-deserved lunch for his kind favor. Monday: On his way into the city, Martin picks me up at my house and drops me off at the dealership. Somehow, I manage to calmly explain the problem to the service manager, making sure to note my oddly expensive service history and the car’s complete failure two days after its recent visit to their shop. He agrees with my description of the situation as “unacceptable.” They provide me with a dark-blue Sentra as a free rental car until the problem is fixed. The service department calls me before 10 a.m. the same day, explaining that the problem was a malfunctioning “crank position sensor” (whatever that is) and that the car is now running well. I return to the dealership after work, turn in the rental, and pick up my restored car free of charge. Best of all, the service manager personally offers me a $100 deposit toward my next service as a goodwill gesture, which I greatly appreciated. This could have been much, much worse. What if my engine had cut out while I was driving in the middle of nowhere, or while traveling at 75 mph on the Turnpike, or while crossing a Center City intersection during rush hour? And what if the temperature was in the teens instead of the 70s? Seriously, if you drive often and don’t have a membership with AAA, make sure to get one. Their annual fee ($59.50 this year, or less than five bucks per month) is worth every cent. 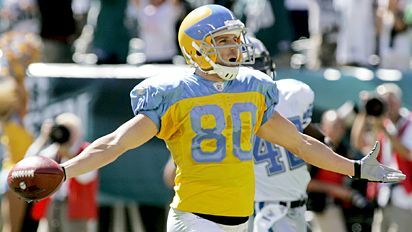 According to a Wikipedia article, the original color scheme of yellow and light blue has its origins in Philadelphia’s city flag, as well as from the Eagles’ predecessors, the Frankford Yellow Jackets. Fortunately for everyone’s eyesight, the club switched to green and white by the late 1940s. I’m starting to think that every uniform designer before 1950 was completely color-blind. (Another example is Penn State’s original choice of pink and black for its school colors in 1887.) Or, as my friend John observed, maybe team colors simply didn’t matter that much in the days before television. Despite their garish appearance, the Birds should consider wearing those old threads more often. This afternoon, they racked up a team-record 42 points in the first half and went on to pummel Detroit, 56–21. In fact, the final score tied a record that’s nearly as old as their uniforms; the Eagles hadn’t scored 56 points in a game since defeating the Chicago Cardinals in 1953. Even though Phil Collins was probably half-joking when he referred to his 2004 solo concerts as the First Final Farewell Tour, I was reasonably sure that his touring days had come to an end. And given that it had been a full 15 years since he had last hit the road with Genesis, I doubted that they would become the latest veteran rock band to launch a reunion tour. The six-month wait and expensive tickets ($127 each, before the inevitable Ticketmaster fees) for the Turn It On Again Tour were certainly worth it. My dad, my sisters Jen and Meg, and I enjoyed nearly three hours of unparalleled music and showmanship. Starting with a blazing instrumental medley of “Behind the Lines” and “Duke’s End,” Genesis played a well-balanced setlist, alternating between long jams from their prolific ’70s catalog and instantly recognizable singles from their commercial peak in the ’80s and early ’90s. The band still sounded fantastic, due in no small part to drummer Chester Thompson (far left in the photo above) and guitarist Daryl Stuermer (far right), who have both accompanied Genesis on the road since 1977. The concert was visually impressive, too. Much like the show from the We Can’t Dance Tour that I attended in 1992 (about a week before graduating from high school! ), the show featured a large video screen that accompanied each song. For this tour, the digital backdrop alternated between psychedelic patterns, animated figures from their album cover illustrations, and a collage of photos and video clips of the band from their early days. Whether or not Genesis ever decides to “turn it on again” for another tour in the future, I doubt that we’ll ever see another band quite like them. Stop rolling through stop signs (assuming you even notice them). I know you’re in a hurry, but those pesky red octagonal signs are there for a reason, and they’re not optional. And if you carelessly blow through a stop sign near me at an intersection, and I call you on it by honking the horn or throwing my hands into the air, don’t you dare smile and mockingly wave at me. Stop asking me to donate a dollar or two to a charitable organization after my groceries have been tallied in the supermarket check-out line. It’s wonderful that your chain of stores wants to give back to the community. But I prefer to choose the causes to which I contribute money, and while I have every right to politely decline the cashier’s invitation, doing so makes me come across as selfish and uncaring (and I’d like to think that I’m neither). Stop trying to extend the Christmas season any further. There is no reasonable explanation for the L.L. Bean catalog, one with snow-covered pine trees and CHRISTMAS 2007 on its front cover, that appeared in my mailbox earlier tonight. I’m still wearing shorts on a regular basis, I haven’t even begun to think of ideas for a Halloween costume, and according to my calculations, we still have 102 shopping days left. Please cease and desist until Daylight Savings Time ends. Without question, 2007 is the Year of Scandals in U.S. professional sports. Over the past six weeks alone, Barry Bonds surpassed Hank Aaron’s career home-run record amid long-standing allegations of steroid use; Tim Donaghy, a respected NBA referee with 13 years of experience, admitted to gambling on games that he officiated; and most disturbingly, Atlanta Falcons quarterback Michael Vick pleaded guilty to conspiracy in a dogfighting ring. NFL security confiscated a video camera and tape from Patriots video assistant Matt Estrella on Sunday when he was working on the New York Jets’ sideline during New England’s 38–14 victory. The league has confirmed that it is investigating whether the Patriots were taping the Jets’ defensive coaches as they signaled to players on the field. However, league sources told ESPN’s Chris Mortensen that Goodell has already determined that the Patriots have violated league rules when they videotaped defensive signals by the Jets’ coaches. * Update: Well, the NFL did indeed deliver some swift punishment for New England’s daring stunt — Belichick was fined $500,000 (roughly 12% of his annual salary) and the Patriots were ordered to pay an additional $250,000. On top of that, the commissioner added a strange conditional punishment: the Pats must surrender its first-round draft pick next year if they make the playoffs this year, or its second- and third-round picks otherwise. 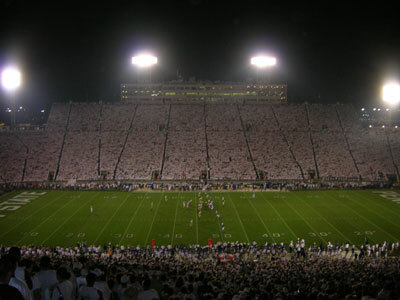 When my friends Laurie and Mike graciously offered to host me at their State College condo for the eagerly anticipated weekend of Penn State’s rematch with Notre Dame, I couldn’t resist. Mike and I shared a surprisingly easy ride to State College after work on Friday, and after meeting up with Laurie, we headed to the Rathskeller for a few beers. Due to stifling temperatures inside the basement bar, we opted to enjoy our ludicrously cheap pitchers on the outdoor concrete patio, and chatted with a handful of good-natured ND fans (who clearly have good taste in watering holes). We closed the evening with a quick stop by The Links Pub & Cafe, an establishment apparently owned by former PSU player Joe Nastasi, and decided to call it a night. I made the trip to State College without a ticket to the game, and hoped (but certainly didn’t expect) to find an available one for sale. If an extra ticket failed to surface, Mike and I had planned to simply watch the game at a local bar. But miraculously, just over an hour before the 6 p.m. kickoff, one of Laurie and Mike’s friends contacted us. The gentleman offered his lone unclaimed ticket for face value ($49, an unthinkable bargain compared to offers from scalpers we’d met and the insane $1,100 quote from some brokerages). But I insisted on doubling his offer and gave him an even $100 — and that was before learning that the available seat was on the 45-yard line! With that purchase, I have forfeited any hope of winning the lottery. Finally, it was time for the big game. After an ugly 41–17 beatdown in South Bend last year, Penn State players and fans alike were hungry for revenge on their home turf. The Irish jumped out to an early 7–0 lead, but Derrick Williams’ thrilling 78-yard punt return for a touchdown set the tone for the rest of the game. As usual, the PSU defense was stellar (the Irish were held to zero yards rushing and just 144 yards overall), and the PSU offense was productive yet frustratingly inconsistent. The game was very sloppy, with PSU and ND committing a combined total of 21 penalties, but in the end, the Nittany Lions wore down the Irish defense and pulled away for a 31–10 win. On Sunday morning, Laurie’s brother-in-law called us with a report of heavy congestion along the main route home, so we opted for a longer but more peaceful trip along I-80 and the Northeast Extension. But every mile was well worth it — thanks for everything, Laurie and Mike! I haven’t posted any updates on here for a while, mostly because my home computer, a 2001-era Dell Dimension, completely broke down early last week. But my new and surprisingly affordable HP Pavilion desktop (loaded with the visually stunning Windows Vista) is up and running, so let’s get caught up on the first week of college football. The Nittany Lions were favored by 38 points in their season opener, and they easily surpassed that margin with a 59–0 rout over FIU. Penn State’s defense continued where they left off last season, recording their third shutout in six games. 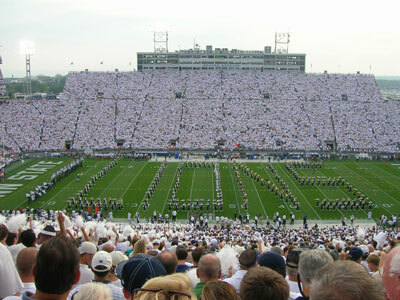 Glad to see PSU is off to a good start in advance of their rematch with Notre Dame this weekend. However, I wasn’t able to actually watch the game, thanks to the boneheads who run the new Big Ten Network. The channel is only carried by DirecTV as of now, and even getting that service is extremely difficult (as Sports Illustrated columnist Stewart Mandel recently discovered). Thanks to BTN’s stubborn and foolish demands of Comcast, I couldn’t watch the game at our shore house in Avalon or at any bar on Seven Mile Island. Instead, I was reduced to occasionally checking for score updates using my cell phone on the beach. I know it wasn’t a high-profile game, but after eight months without PSU football, I still want to see my alma mater take the field. (In fact, I would have gladly paid to see it.) So, thanks for nothing, you BTN morons. You’ve managed to alienate your own fans, and you can expect a very angry e-mail from me. It’s no secret that I detest Michigan. When PSU football joined the Big Ten during my sophomore year in 1993, I viewed Michigan as a noble adversary in the conference. But I changed my mind after some very questionable late-game officiating helped the Wolverines narrowly defeat the Lions in 2002 and 2005, the latter of which I witnessed in person. So, I was ecstatic to hear that Michigan, ranked fifth in both preseason polls and picked by many to win the Big Ten title, lost their home opener to little-known Appalachian State, 34–32. As a result, the Wolverines became the first ranked Division I-A team ever to lose to a I-AA team, and most regard Michigan’s jaw-dropping defeat to be the biggest upset in college football history. Plus, Michigan took the largest single-week plummet ever in the polls, from No. 5 to unranked in one fell swoop. For the record, among I-AA schools, Appalachian State is a very good team, having won back-to-back division titles in 2005 and 2006. And ASU deserves a lot of credit; their win was no fluke, and they pulled the upset on the road in front of over 109,000 fans. Hail to the victors, indeed: the Appalachian State Mountaineers. However, Michigan simply has no excuse for losing to a I-AA program with a fraction of UM’s resources and funding, and they know it. Despite their huge achievement on the gridiron, the Appalachian State community still can’t live down one of the most embarrassing promotional videos ever created. Its unofficial title is “HOT HOT HOT,” and the video is not to be missed. Seriously, click on the link and watch the clip. Now. Once you’re done, head over to the college football blog Every Day Should Be Saturday for a thorough, priceless analysis of the unspeakable carnage.